Yellow sapphire in Gold, Emerald & Diamonds in platinum, Large golden yellow sapphire in Gold, Real salt water pearl in Silver, Burma Ruby-Real coral in Gold, Emerald & Diamond in silver, Emerald in gold, Diamond in Platinum & Yellow Sapphire in Gold etc. This serves to justify our slogan ” Discover the Difference ”. 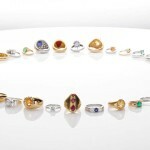 All the rings are made with due care, procedure and consideration without cutting any corners.